The work of acclaimed German artist Christoph Schlingensief spans three decades and a diverse range of fields, including, film, television, activism, opera, and theatre. 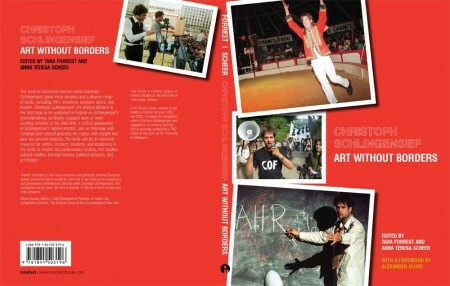 Christoph Schlingensief: Art Without Borders is the first book to be published in English on Schlingensief’s groundbreaking, politically engaged body of work. Leading scholars in the field offer a critical assessment of Schlingensief’s hybrid practice, and an interview with Schlingensief himself provides the reader with insight into past and present projects. The book will be an essential resource for artists, curators, students, and academics in the fields of theater and performance studies, film studies, cultural studies, German studies, political activism, and art history. Tara Forrest is Senior Lecturer in Cultual Studies, University of Technology, Sydney. Anna Teresa Scheer is a performer and director who worked at key theatres in Berlin including the Volksbuhne where Christoph Schlingensief was engaged as an in-house director. She moved back to Australia in 2007 where she is completing her MA thesis on his work.